"Deathing is a landmark contribution to human healing-not just for persons approaching death (who isn't?) but for those entrusted with their care, such as physicians, nurses, and family. This book is a magical blend of practicality and spirituality. It will help many find peace in life's crowning event." -Dossey, M.D., author of Space, Time & Medicine. Everyone who is born is someday going to die. Some of us will die peacefully in our sleep, some will die in accidents, and some as the result of diseases, cancer or AIDS. Because we do not usually know when we are going to die, most of us are frightened of death. We do not want to talk about it, do not want to face it, and we run from it as long as we can. And some of us die a lonely death--in a hospital, surrounded by strangers and white sheets, while family and loved ones are kept out of the room at the final moment. Anya Foos-Graber believes that death, like birth, should be a shining, light filled, conscious moment. Death is not a disease. It is the most natural passage we will make since birth. Looking at death before the time comes is like learning about natural childbirth before having a baby. Just as women are choosing to be conscious participants in the birth process, Foos-Graber feels that all of us should be conscious as well of our eventual death--that we should prepare for it the way the Tibetan Buddhists and American Indians used to do. The author calls this process of conscious preparation and practice deathing. The book presents two teaching stories, illustrating both a conscious death and an unconscious one. 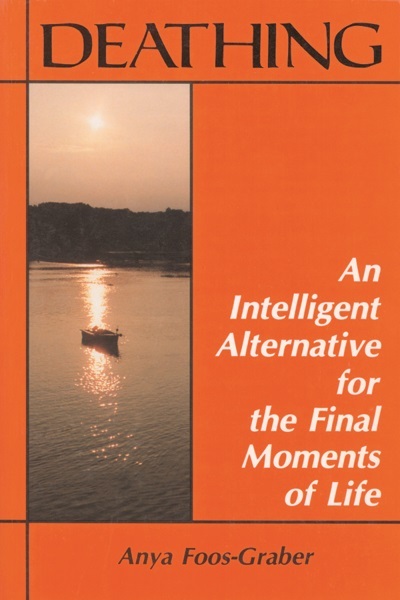 The second half of the book is a step-by-step manual, containing complete instruction and simple exercises--such as breathing, visualization, and the all important, "6th technique," or your chosen "Name and form of God" to which you direct your attention in life and the death transition. You can use the formless LIGHT itself as referent, an absence of any belief structure. A support person rather like the father's presence in natural childbirth can assist in the event of coma, or accident death. Other books have been written about grief, about wills, about taking care of your affairs. This is a book about taking care of yourself, and how to be helpful to someone you care for. Deathing has two aims: to make sure that the dying are comfortable and comforted as they die, and to help all of us prepare for the greatest adventure we will face since birth.